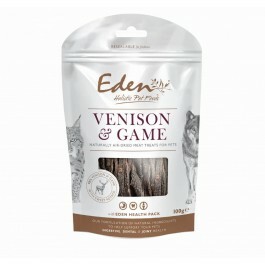 What is in Eden ‘Venison & Game’ treats for cats and dogs? 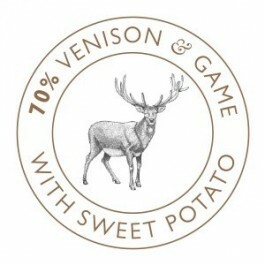 Composition: Venison (44%), Mixed Game Meat (Inc: Buffalo, Bison, Wild Boar) (26%), Vegetable Glycerine, Sweet Potato, Eden Health Pack (Cellulose, dried parsley, sodium hexametaphosphate), yeasts (a source of mannan oligosaccharides; prebiotic MOS), chicory inulin, glucosamine (5.6%), A blend of organic acids and minerals. 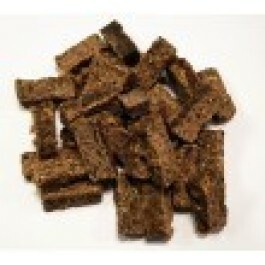 Analytical Constituents: Crude Protein 21.3%, Crude Oils & Fats 13.6%, Crude Fibre 4.5%, Crude Ash 3.1%, Moisture 22.2%.